Three classic Kamen Rider films, Kamen Rider Shin, ZO, and J have been announced for a Blu-ray box set in December. Kamen Rider ZO is considered a retelling of the original story with a strong, reliable protagonist being turned into a cyborg with grasshopper-like powers, while Kamen Rider J sees for the first time a Kamen Rider growing giant. Both films were directed and designed by Keita Amemiya, best known for the GARO franchise. Shin Kamen Rider was the first official attempt at a Kamen Rider project aimed for adults exclusively. Both the organic look of the creatures and the explicit nature of the gore scenes were the highlights. While Amemiya didn’t direct this installment, he did supervise the special effects scenes. 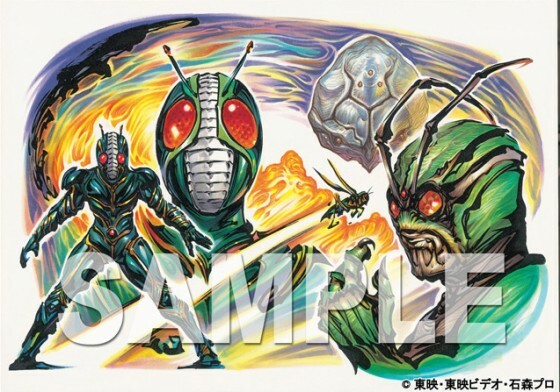 The set includes a bonus disc with Kamen Rider SD, the one shot straight-to-video anime. The box art was drawn by Amemiya as well. The boxset, published by Bandai Visual, will be released on December 24, 2015 and priced at 15,000 yen.